Shown in 3 sizes labeled S/M/L. A table in the back of the book defines these as to fit 35.5, 39.5 and 41.75 inch (90, 100 & 106 cm) hip circumference, or 41.75, 44 and 47.25 inches (106, 112, & 120 cm) finished measurement above the bottom ribbing or hem. As this is not a shaped sweater, the hip and chest measurements of the finished sweater would be the same. Other key measurements are found on the table on page 136. The Rauma leaflet contains differing sizing: 108, 117, 125 and 131 cm. finished chest measurement. 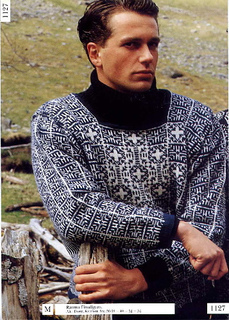 The sweater is pictured on the cover of the Rauma leaflet. See the source page to view it. The Rauma leaflet offers additional sizes: Finished chest measurements of 108, 117, 125, 131cm. although the yarn requirements are the same. A matching cap is also shown. The sweater is knit in the round with machine sewn steeks for the underarms. Charts are provided for the stranded colorwork. Row gauge is important for this sweater as length is determined by completed repeats of the small square pattern motifs. Double pointed needles and both short and long circular needles will be needed as will stitch holders and markers. Detailed yarn requirements: 8-10 balls darker color and 6-7 balls white or light color are required. One ball of Finullgarn contains 180 meters. Kvartett is recommended in the Rauma leaflet. It was a cotton yarn that knit to the same gauge as Finullgarn. The colorwork design on this sweater looks very complex but is actually a fairly easy pattern to knit with no long floats and a regular repeat. The sweater construction is carefully described. Diffuculty level, in this editor’s opinion is medium. NOTE: This pattern was also published in Norwegian as Rauma leaflet number 1127.